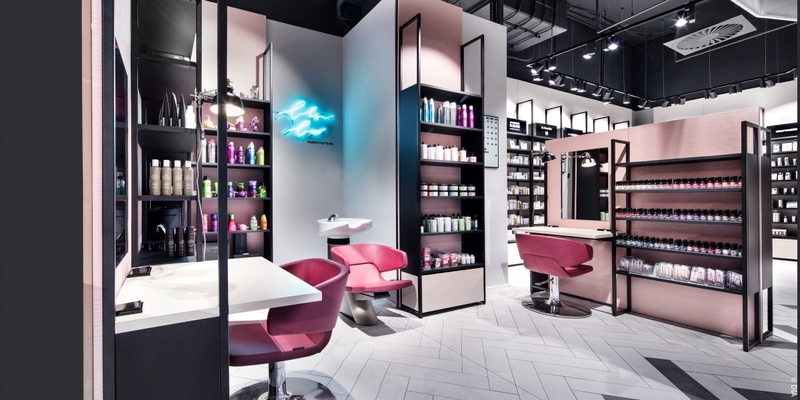 “What is the origin of trade?“ That’s the question Mattias Mußler, Managing Director of Mußler Beauty and Frank Dittel of DIA – Dittel Architekten asked at the beginning of the project before they created the first Mußler Beauty by Notino store in Stuttgart’s Gerber shopping mall. Their objective was to build a shared foundation to showcase an online/offline union. The reason for this: just last year, Mußler Beauty, the iconic company with its long tradition and proven track record of success merged with Notino, one of Europe’s largest online retailers for beauty products. The answer to this fundamental question led them to the Orient. “In the Arab world, markets were the center of social life and embodied the original idea of the retail trade. In this setting, retailers are physically separated by merchandise and trades. 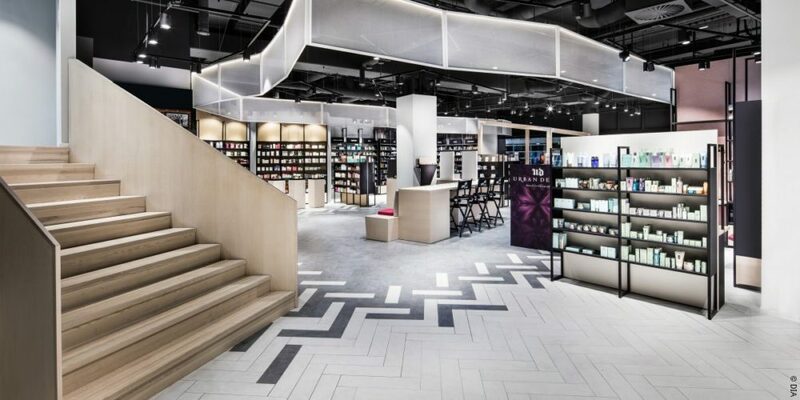 We created the areas of the Mußler Beauty by Notino store, which features 300 square meters of floor space, based on this concept to fully embrace the large variety of products in the world of perfumes,“ says engineer Frank Dittel. The areas were then incorporated into the store design and feature different looks. According to Dittel, the project implementation took four and a half months, during which planning and implementation partly overlapped to ensure a quick store opening. The completion took almost nine weeks. He adds that the overall store is primarily driven by its consulting services. Eight staff members are available to assist customers. They can also introduce products that are not showcased on the shelves and thus create a link to the online store. After all, another aspect of this concept is to feature niche products and forego showcasing the store’s wide variety of available products. If a certain product is unavailable at the store, customers can order it online and have it sent to their home. The store associates communicate to customers that they may certainly purchase any of the items but that they should not feel obligated to do so. What’s more, products that were ordered online and don’t meet customer satisfaction can also be returned to the store, also in conjunction with an additional consulting session. There is also a click & collect option. This store pickup alternative is designed to attract more customers to the store. Dittel emphasizes that “the concept of the store is to build trust and create a brand experience. The services are designed to show the customer what this brand stands for. Customers also take this mindset home with them and remember it when they use the online store.“ After countless conversations with companies, the architect is certain that a brand generates far more revenue in places where it is present in both online and brick-and-mortar settings versus situations where there is no connection between online and offline channels. That’s why the store’s “online/offline symbiosis“ explicitly embraces and welcomes showrooming. The sectioning into different areas is reflected in the store’s use of different materials and color palettes, especially on the rear walls. To echo this, the designers created different subtle color schemes. The key materials are wood, metal, and leather. Especially the men’s department reveals its very own charm with a more rugged look. The three columns in the front and their product selection appeal to three different age groups – 60, 40 and 20-year-olds. White, indirect light ceiling mounted panels frame the different areas. Numerous track light fixtures with warm-white color are the primary light sources. The people in charge emphasized a certain level of flexibility for the entire system – not just as it pertains to the light fixtures but also when it comes to the furnishings, which were custom designed for the store by DIA and built by the Czech shopfitter Bakos.